The ProGear 400LS Air Elliptical and Exercise Bike Combo is perfect for apartments or space limited areas, where space saving is a priority. It will provide a low impact upper and lower body workout using the natural elliptical motion to eliminate any stress on joints and ankles. Then, if you want to switch your workout to an exercise bike, a comfortable large adjustable seat makes the transition very simple. The combination of an elliptical and exercise bike workout will work more and different muscle groups than a singular fitness machine. 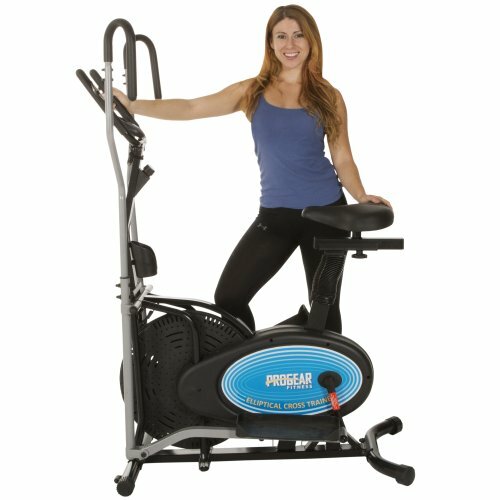 So increase the value and effectiveness of your fitness machine by using the ProGear 400LS All in One. Features: 14" Stride Length with backward stride capability. 4 direction adjustable expanded extra large seat for all users. Additional weight capacity up to 250lbs. Reinforced crank system for consistent momentum. Easy dial tension adjustment for a more or less challenging workout. An easy to read computer LCD display that indicates distance, calories burned, elapsed time, speed and heart pulse. Water bottle holder included. Additional stationary arms with dual pad pulse sensors. Stationary arms provide an option to using the dual action arms. Heart pulse monitor calculates the heart rate so you can stay within your target heart rate zone. Larger pedal construction with ribbed dot design to prevent foot slippage when exercising. Transport wheels provide for easy relocation. Dual Action workout arms provide an additional upper body workout. Some assembly required. Warranty: 1 year limited. Origin: China.